Since the organisation of the upcoming 2009 Kids in Tow Tour has been dominating much of my free time of late (not to mention that of Mrs 6k), I figured that it was about time I looked forward to the actual event, rather than cursing the eternal paperwork and pondering over what drugs to give the children before the 12 hour flight. Thus, I went searching for a suitable photo to illustrate the beauty of what used to be my second home – now probably relegated to about fourth, but still somewhere I’m very fond of – The Isle of Man. Here’s one of those photos – this is the top end (geographically) of the Island. Now here’s a bit of a pet peeve. I don’t mind photographs being altered, enhanced, fiddled with etc. I recognise that it can be an extension of the creative process which began with actually spotting the opportunity and taking the photograph. What annoys me slightly is when almost every photo seems to be adulterated in that way. Especially when the subject matter – in this case, my beloved Island – is surely beautiful enough not to need touching up in this way. But maybe I’m wrong. Ray Collister, Barbara Elaw and Suddhajit Sen, whose names appeared more than any others in my flickr search, have all tinkered extensively with their pictures of the island. As I said, this is a pet peeve of mine, but since I’ve always been a sucker for black and white images and – since that balmy Thursday afternoon back in ’89 when I met Jean Guichard on a District Line train near Victoria* – lighthouses as well, I’m more than happy to have this picture on the site, since it ticks the important boxes. I am literally shaking with lack of sleep. Or it could be lack of red wine. Or lack of hot weather. On days like today – grey, overcast, chilly and damp – it’s sometimes difficult to remember the heady days of summer, even though they were here with us just a few short weeks ago. 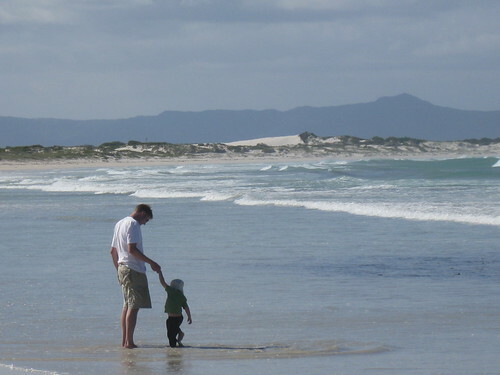 Here’s a quick reminder of those warmer times with Alex and I splashing in the shallows at Struisbaai. Of course, these days, the beaches of the Western Cape are much more famous for beached whales. Surfers in South Africa are being warned to watch out for sharks off the coast of Cape Point where the carcasses of 55 whales are beached. The stranded whales were found at Kommetjie Beach. Hundreds of volunteers had tried to push the False Killer whales back out to sea – around a dozen of them later died of exhaustion and stress while 40 more were shot by authorities. Although the authorities are clearing the carcasses, Ian Klopper of the National Sea Rescue Institute warned people to be on their guard because sharks may be looking for the whale carcasses. The official line is that the authorities were shooting the whales because their cries of distress were attracting more whales onto the beach. However, it seems more likely that the whales were shot because South Africans enjoy shooting things and this was too big an opportunity – and too big a target – to miss. Like fish in a barrel. Sort of. Carol Brown, formerly with the Durban dolphinarium, said Cape Town was clearly not geared for a mass stranding. Of course there should, Carol. Unfortunately, the 2009 rubber duck and whale stretcher budget was apparently cut after there were precisely zero mass beachings of whales in the last decade in Cape Town and was spent on something slightly more worthwhile; like building houses for those people living in shacks and providing food for hungry children. Do make a submission to the City Finance Department for an increased rubber duck and whale stretcher budget for next year though, won’t you? Or better still, move back to Durban and waste their bloody oxygen instead of ours. It’s been a great afternoon. About half way through the Bulls versus Crusaders Super 14 semi-final, with the score a tantalising 27-23, Mrs 6k decided that it would be a good time for us to take the kids up to the local school field, let them run around and let me not watch the end of the rugby. Her plan was extremely successful on both counts. But I’m glad we went. The kids enjoyed the mud on the churned up fields after the morning school rugby games and I booted a properly shaped ball around, chased Alex and took photos of the sky and the mountains. I was even allowed to look up the Bulls score on the way home. Result. Literally. 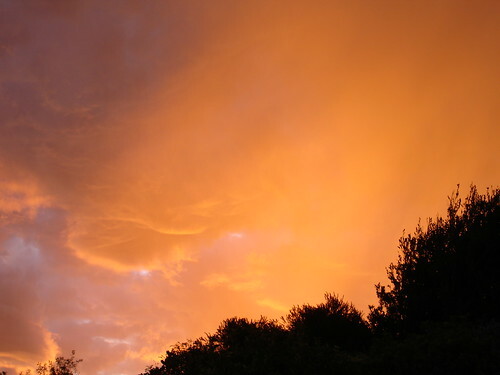 I was working hard on the first Peroni of the weekend when I glanced outside to see a completely orange sky. Now, I’m very used to blue, quite used to black with tiny white dots in and sadly, becoming used to grey again, but orange is still a bit of a novelty. Quickly grabbing the point-and-shoot camera – mainly because I wanted to take photos and it’s the only camera I own – I ran outside, climbed on top of the braai, pointed and shot. I should probably inform readers at this point that we have a built-in braai and it wasn’t a Weber or one of those rubbish disposable things. That would have taken a monumental amount of balance or made absolutely no difference to my overall height whatsoever. Or both. No, our braai is pretty big. Fortunately the sky is also pretty big and I was able to not miss on a number of occasions. This probably being my favourite hit. Although I quite like this one too. You can see the whole lot of them on flickr and make your own decision. And once again, I must remind you lovely people that taking good photographs in Cape Town isn’t difficult. Most of the work is done for you. So yes, despite the fact that I think some of these are “good”, once again, none of them are exceptional. And, once again, I’m left wondering if I can at least partially overcome the paucity of my talent by buying a better camera. The alternative, of course, is to spend that camera money on beer, and then see if my creative abilities are augmented by imbibing (what I calculate to be) about 1,000 bottles of Amstel. Being a scientist, I am tempted by the idea of exploring both possibilities as fully as possible. 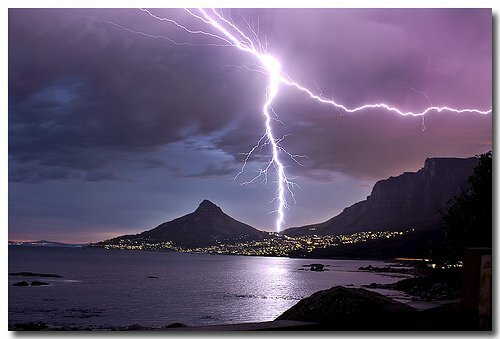 Spectacular shot of Cape Town thunderstorm this morning, taken by Hout Bay photographer John Maarschalk, (bigger here) via here. Alex and I stood for 30 minutes watching the lightning out of the window this morning. Although it wasn’t a particularly big storm, it was pretty active and there was plenty to keep him occupied. Alex is three years old and is less scared of thunderstorms than his mum. No comment. Why is the lightning striking Kloof Nek rather than the 670m Lion’s Head or the 1050m Table Mountain? EDIT: Many apologies to John. I emailed him to ask permission to use the picture, wrote the post and then managed to hit PUBLISH instead of PREVIEW. They should make those words easier to tell apart. Thus, when he arrived on the site, his photo was already here. Needless to say, I do now have the go-ahead. Thanks and sorry again, John.